One guaranteed thing to bring everyone together? Karaoke! A good karaoke bar can turn perfect strangers into the best of friends. What’s better than bellowing out your favorite hits in front of your pals? Arizona is chock-full of karaoke bars for your next late night performance. Grab some liquid courage and head to one of these local karaoke bars. The Grapevine has all the attributes of a good karaoke bar. It’s dark, crowded, and filled with a boozy crowd. The Grapevine has been a late-night karaoke spot since it opened in 1971. Today, they offer nightly karaoke from 5 p.m. until 1 a.m., and 2 a.m. on weekends. They have a huge library of songs and raucous crowd ready to sing a long during your next legendary performance. The Grapevine also has signature cocktails and a large upstairs patio that makes an ideal location for your post song beverage. Have you ever seen “The Gong Show?” Then you’re already familiar with Mr. Head’s cutthroat karaoke. Mr. Head’s is a hipster hangout in the middle of Tucson’s 4th Avenue shopping district. It’s filled with local artwork, a large draft beer selection, and the most intense karaoke night in Tucson. Karaoke singers beware of the gong. If you hear the gong, your performance will come to an abrupt end. If you make it through, however, you’ll get a discount on your next drink. Their weekly Thursday night karaoke starts at 10 p.m.
What the duce? You might be confused on your first trip to The Duce. This Prohibition Era bar has some of the most unique features of any local bar. Set in a converted 1928 warehouse, the Duce is filled with everything from swing dancing to a boxing ring. The Duce has karaoke every Wednesday from 7-11 p.m. You’ll duke it out with other vocalists in a boxing ring in a test of karaoke supremacy. Monte Vista Cocktail Lounge is a historic bar in the heart of downtown Flagstaff. What makes it historic? Well, it was Flagstaff’s first speakeasy and was a hotspot for lawbreakers until it was raided in 1931. Today, the bi-level cocktail lounge is back up and running. They hold a variety of events including live music and trivia nights. But the real draw is karaoke. 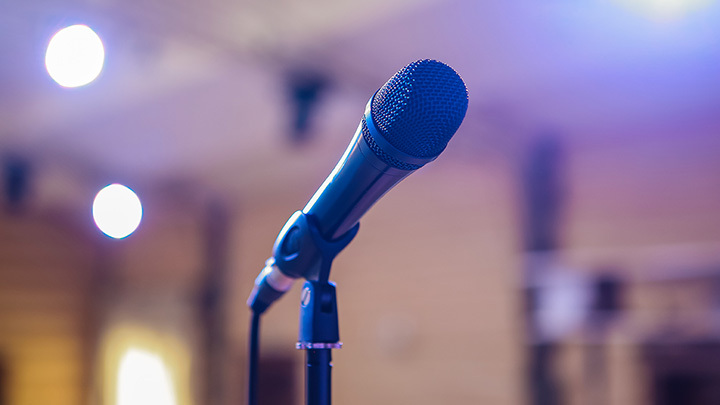 Monte Vista’s karaoke nights are a popular local event and kick off every Tuesday and Thursday night at 9 p.m.
Stand-up comedy, shirtless shots, and goldfish races. You never know what you’re going to get at Monkey Pants Bar & Grill. This Tempe dive bar is always entertaining, especially on karaoke night. You’ll find everything from group performances to over served patrons singing the classics. Monkey Pants has karaoke every Wednesday, Friday, Saturday and Sunday beginning at 9 p.m. Steaks, shuffleboard, and singing? What more could you want? Shooter’s is more than just another steakhouse. After dinner, it turns into a full-on karaoke bar with fierce competition. They have a mix of old classics to modern rap to go with an energetic, fame-hungry crowd. Karaoke starts at 9 p.m. on Mondays, Wednesdays, and weekends. Ernie’s is part sports bar, part dive bar, and most importantly, a really good karaoke bar. Ernie’s has been a Scottsdale staple since 1973. The casual bar is a great alternative for crowds looking to avoid Old Town. You’ll find pool tables and sports instead of blaring music and overpriced drinks. They have a top of the line sound system, large music library, and laid-back vibe. Plus, you can sing karaoke seven nights per week. Karaoke starts nightly at 8 p.m. Looking for a five-star dive bar? Look no further than Brigett’s Last Laugh. Brigett’s has all the dive bar staples—a mixed crowd, neon beer signs, and cheap drinks. It’s also known for events including stand-up comedy, trivia and yes, karaoke nights. The judgment free karaoke is a great place to test out your vocal skills. Regulars are known to sing-along to everything from heavy metal to top 40 hits. Brigett’s hosts karaoke night seven nights per week starting at 9 p.m. This old-school hangout is filled with 1970s décor and a lively karaoke night Thursday through Saturday nights starting at 9 p.m. It gets a mixed crowd as its close to both the University of Arizona and Tucson’s Convention Center. It’s also been named the best karaoke bar in Tucson by both The Arizona Wildcat and Tucson Weekly. Rips Bar is an old-school dive bar with live music, local artwork, and classic bar games. It’s one of the last standing bars leftover from a pre-renewal Phoenix. Their one-of-a-kind karaoke nights feature a large mix of energetic people. On Sundays and Mondays starting at 9 p.m., get your karaoke groove on. When not singing your heart out, you can play pool, darts, or pinball or enjoy some time on their large patio. View more Arizona Bars and Saloons.